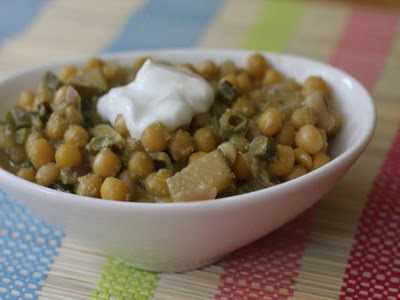 I've never met a chickpea recipe I didn't like. Ever. This one, from the lively little e-cookbook authored by Srivalli of Cooking 4 All Seasons, host of MLLA 18, is no exception. 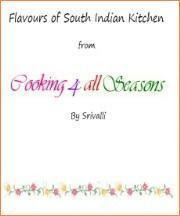 Flavors of South India Kitchen is a fifteen-recipe collection of some of Srivalli's blog recipes, as well as a sneak peek of new ones which are slated for publication in a larger book version in 2010. 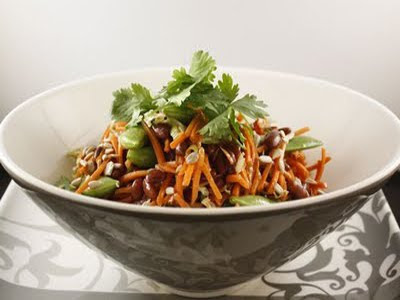 I am very pleased for the opportunity to lend my support to Srivalli's venture, as well as enjoy the privilege of featuring one of her recipes, a spice-charged mountain of basmati rice and chickpeas. It is enough to feed an army and packs well for commuter travel. 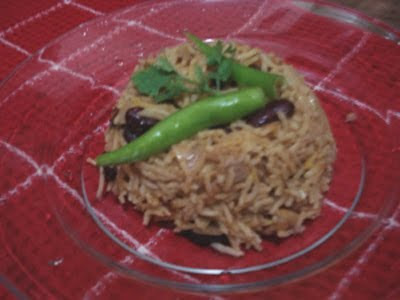 Channa Pulao - Reprinted by permission. 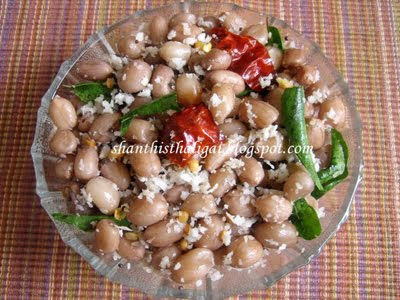 © Copyright 2009 - Srivalli Jetti. All Rights Reserved. 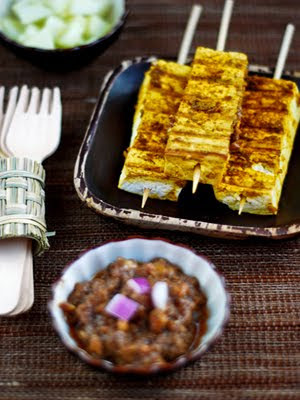 Kabuli Channa - 1 cup, pressure cooked separately with little salt. 1. 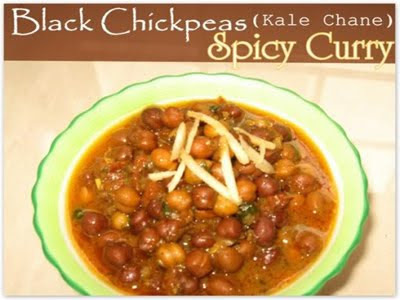 Soak Channa overnight. Then pressure cook with little salt till soft. Drain the channa and store the water for cooking rice. Meanwhile wash and soak basmati rice for 15 mins. 2. Grind all the Masala ingredients to fine paste. 3. 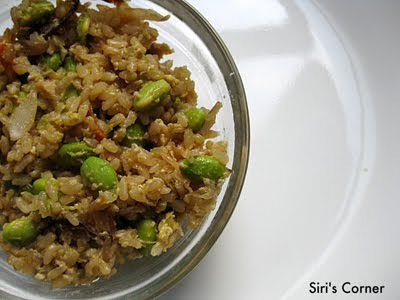 Once rice is soaked for 15 mins, heat a pan with ghee. Add cumin seeds, cloves, cinnamon, bay leaf. Fry for few mins. Then drain rice and fry for few mins ensuring the rice does not break. Add 2 cups water (channa water and water used for soaking the rice) and pinch of turmeric and salt. Cover and cook till its done. Rice should be separated and not sticky. Keep aside. 4. Heat oil in a big kadai, add onion julienne, fry it it's brown in colour. Add the ground masala, cook on high flame for few mins, add chili powder. Simmer for 5 mins. 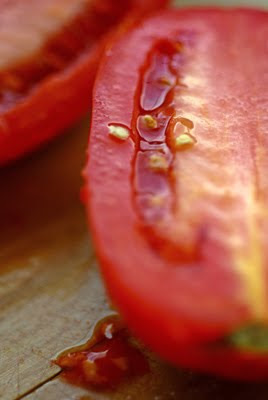 Then add tomatoes with salt. Cook till it’s soft and mashed. 5. 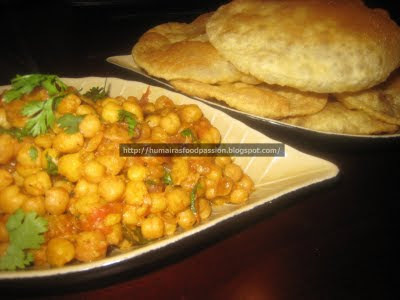 Then add cooked channa and mix well. The masala should not have water in it. Then gently mix the cooked rice to this masala. Simmer for 5 mins. The rice is ready. Notes: Please adjust the chili as it’s added both whole and powder. Since salt is added in all process, ensure you adjust to your taste. Thanks to Srivalli for allowing me to reprint her recipe and for hosting MLLA for the second time this year. You have all been critical to the success of MLLA. I am indebted to your delicious contributions and look forward to kicking off another year with you, a Happy New Year! Poinsettias have evolved a long hybridized way from the traditional velvety, bordello-red botanical decorations clustered in the dining rooms and shopping malls of my youth. They now come in colors of golden cream, faded plum, and vivid salmon, as well as the variegated variety I snapped yesterday. These poinsettias sat among hundreds of bold, bracted plants that undulated and levitated in a cramped greenhouse shielded from the icy winds that forecasted, and delivered, a foot of snow a few hours later. Had I been paying more attention to the tag tucked in the soil line, I would have noted which cultivar it was. But I was so blinded by the wild, saturated beauty surrounding me that the moment was all that mattered, a moment captured just for Jacqueline of Tinned Tomatoes, who put out the A.P.B. for Festive Photos for No Croutons Required*. May we all be so blinded this holiday season. 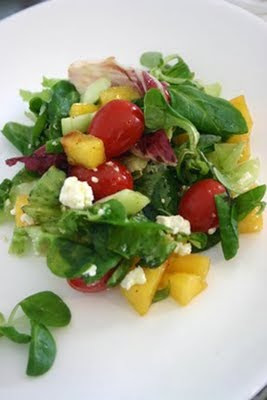 *No Croutons Required is a collaborative food-blog event effort by Jacqueline, and Lisa of Lisa's Kitchen. I can only speak for myself, but Christmas feels a little early this year. Perhaps it's because the tonnage of pumpkins and various other squashes I trudged home with over a month ago are still waiting for their debuts in various soups, breads, and custards; they are configured on the floor in something of an obstacle course at the threshold of the kitchen. Remarkably, I have not lost any to those queasy spots of dry rot nor lost my footing stepping around them. Clearly, I am pressing my luck, and clearly, I have to hack and seed the lot of them, if only I didn't get distracted with so many other goodies. No, I'm not talking about Christmas cookies (not yet, anyway), nor wassail bowls, nor any other traditional December tiding recipes. I'm talking about potatoes. New potatoes, actually, the kind that are tiny as marbles, and often mistaken for pearl onions in netted bags unless you take a closer look. You can sometimes find them loose in bins among the "older" new spuds, the ones of fingerling length or as big as a baby's fist. You don't come across them very often, and you may well pass them by not knowing quite what to do with them. Boiling can get pretty boring. But sliding in a gleam of hot butter in a big, old skillet, skins shrink wrapped and clinging with herbs, is a marvel of culinary economy, comforting carbs, and a clever, quick little appetizer to spear with toothpicks, served straight from the pan for informal gatherings. Sure, I feel guilty for neglecting the orange, green, and yellow boulders on my floor. But at fifteen minutes start-to-finish to prepare sweatbox potatoes, there's really nothing to sweat about. Sweatbox Herb and Butter Potatoes - My mother's recipe, the origin a mystery. 1 pound tiny new potatoes, washed but not peeled. Do not dry. Nick out any "eyes" that might have sprouted, and discard any potatoes that are green under the delicate skin. Green potatoes are toxic and cannot be eaten. Choose a large skillet with a well-fitting lid. Place wet potatoes in skillet, then turn the heat up to medium. Shake the skillet to redistribute the potatoes as the water evaporates. When the skillet is dry and hot, add the butter or oil. It will immediately sizzle. Shake the skillet again to cover the potatoes with the hot fat. Cover the skillet tightly; do not let any steam escape. (This is how the sweating starts.) Turn heat down to medium-low. Let the potatoes cook for about 3 minutes, then shake the skillet. Cook for another 3 minutes, then shake the skillet again. Remove lid quickly to pierce the largest potato with a skewer and check for browning. If it's still hard, and/or the potatoes aren't uniformly browned, close the lid and cook another few minutes, shaking the skillet once again. This recipe is for Laurie of Mediterranean Cooking in Alaska, hosting Weekend Herb Blogging #213 for Haalo of Cook Almost Anything at Least Once. Laurie will have her round-up online by Monday next week. Do be sure to stop by for the consistently tantalizing array of recipes. ... of The Garden Cat Cottage, winner of the Amaltheia Organic Dairy Goat Cheese giveaway. Kathy, please contact me at thewellseasonedcook AT yahoo DOT com with your shipping details. Thank you to everyone who participated. As opportunities become available, I will continue to carefully select quality culinary products (comestibles, equipment, and books) which I believe my readers would enjoy the chance of winning. As always, I am delighted by your visits and comments, and look forward to discovering the new faces who have introduced themselves through this event. An elegant and delicate French soup of green peas, leeks, lettuce, and mint, Potage Saint-Germain is traditionally enjoyed in the spring, when fresh green peas are in season. I stumbled upon one lone packet of shelled peas while marketing for Thanksgiving produce. Among the rutabagas, yams, and green beans, they looked like foundlings in need of a good home. So I adopted them. Days after the feast, they provided the perfect remedy for a jaded appetite, a jade-colored purée of simplicity and good taste. I felt renewed. It felt like Easter. 1 teapoon salt (omit if you've used well-salted stock). Slice leek stalks into coins and separate into rings. Soak rings in bowl of cold water for ten minutes, agitating occasionally. (N.B. - Leeks notoriously harbor sand in their very finely ribbed recesses. Special care must be taken to rid even the smallest particle, which will impart a nasty grit that will ruin the recipe.) Transfer rings into colander (sand will have sunken to bottom of bowl) and rinse under running water. Pat rings with toweling to remove excess water, then add them to a large saucepan where you have gently warmed the butter or oil over very low heat. Sauté leeks until limp and golden, about 6 minutes. Add peas, lettuce, and stock. Bring to boil, then reduce heat to simmer. Cover saucepan, allowing some steam to escape, and cook until vegetables are tender, about 10 minutes. 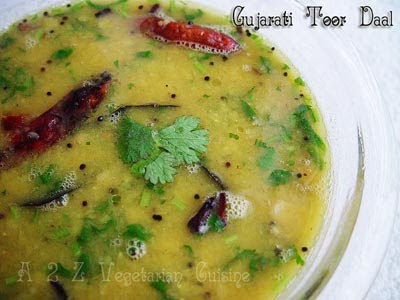 Transfer the soup in batches to a blender, adding mint leaves. Purée until smooth. (Take care; it will be very hot.) Transfer purée into clean saucepan. Add milk or cream, black pepper, and salt. Stir briefly over very low heat. Taste for seasoning, adjusting if necessary. Ladle into serving bowls, drip optional cream onto surface, and swirl with a skewer or toothpick. Add optional mint leaves, chives, and/or croutons. Serve immediately. 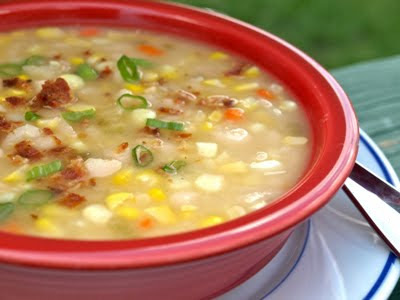 This recipe is for Sra of When My Soup Came Alive, hosting MLLA 17. Sra will have the round-up online as soon as possible. Do stop by and peruse the menu. I'm sure there is yet another feast coming up. Life's little luxuries. They are often unexpected gifts: the hand-written thank-you note from a far-away friend; the cat who spies the spider before it lowers itself onto your head; the Valentine extravagance of Italian black lace languidly pooled in a glossy white box. We all have our favorites. And sometimes, we have to get them for ourselves, like the parcel of certified organic goat cheese I purchased from an artisan dairy hidden in the mountains of Montana, brought to my attention by Toni of Daily Bread Journal, who wrote to me of her visit there while wandering the wilds on a recent vacation. Amaltheia Organic Dairy has been in business since 2000. Named for the Greek mythological she-goat who nursed the god Zeus, the 20-acre, 500-head operation was recognized in 2008 with a Montana Eco-Star Award for its commitment to fully sustainable farmsteading. The owners, Mel and Sue Brown, have also enjoyed awards from the American Cheese Society for their distinctive, vegetarian-friendly chevres. The Browns pride themselves on products that are made exclusively with their own born-and-breed livestock, without dependence on offshore ingredients of any kind. For the health conscious, goat cheese is high in Omega-3 fatty acids yet lower in fat than cow's milk cheese. 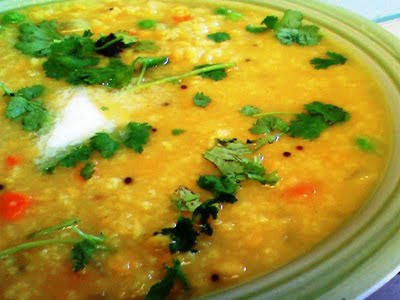 It is generally easier to digest and rich in potassium, Vitamin A, thiamine, and niacin. Four ounces provide 16 grams of protein at the same calorie count as a candy bar, but with no refined sugar, hydrogenated fats, or artificial flavors or colors. Now, it is your chance for a little luxury of your own, courtesy of Amaltheia Organic Dairy*. I will be conducting a random drawing to select one winner who will receive 8 ounces each of the following chevres: Plain, Roasted Garlic and Chives, Spiced Pepper, Sun-Dried Tomato, Perigord Black Truffle, Whole Milk Ricotta, and Feta - a total of 3.5 pounds of cheese. For inclusion in the drawing, please leave a comment on this post by December 1, 11:59 p.m. New York time. You do not have to be a blogger to be included in the drawing. For the purpose of fairness, anonymous readers who are not bloggers must identify themselves in the comment with a first name and first initial of surname which must match the name given me to ship the prize should you be the winner. Due to the perishable nature of dairy products, this prize can only be awarded to residents of the continental U.S. Family and friends are not eligible to win. The winner will be announced in a post on December 2. Good luck, everyone! For those who'd like to try Amaltheia Organic Dairy products for themselves, as I initially did, they are available online or in selected markets nationwide. Flavored with Perigord Black Truffle. *Amaltheia Organic Dairy is the sponsor of this giveaway. I have not been personally compensated either financially or with products in exchange for discussion on this site. It started with a cake. It was the kind of cake that Arthur Rowe "...always liked, especially rich Dundees and dark brown home-made fruit-cakes tasting elusively of Guinness." One did not expect to happen upon such a treat during the rationing days of World War II, when England was at constant risk from aerial bombings. It was the kind of cake that drew a crowd of admirers, longing for a cut of buttery crumble, baked light with "real eggs," to cheer the heart and sweeten the tongue. Others were fixated on that buttery crumble, too, but their hearts held secrets that could not be cheered, nor did they want them to be. But it seemed like Rowe's lucky day, that he should win that "magnificent cake" at a fundraising fair, much to the consternation of those others. As it turned out, it was not his lucky day at all. Billed as "An Entertainment" by its author, Graham Greene's The Ministry of Fear charts a distinctive, enigmatic, and malevolent storyline segmented by the state of mind of its protagonist, Arthur Rowe. Haunted by a crime committed as an act of compassion, conspired against by a fifth column costumed as fortune teller, séance medium, and charity league, Rowe is a man whose fate is as existential and bleak as the irony that grips and plunders his sanity and safety. Life, unfortunately for Arthur Rowe, was never wistfully sweeter than during the brief respite of a seemingly innocent cake in an era when loyalty and love were especially unkind. In a medium bowl, whisk together flour, baking powder, and spices. Set aside. In a small bowl, toss raisins, currants, and fruit peel with ground almonds until fruit is uniformly covered with the almonds. Set aside. In a large bowl, cream the butter and sugar together with an electric beater until soft and fluffy (about 5 minutes). Add eggs, one at a time, beating well after each addition. Beat in orange extract. Slowly beat in dry ingredients, 1/3 at a time, into butter mixture, until batter is thick and well combined. Stir in fruit mixture. Spoon batter into prepared pan. Place pan on center rack of oven. Bake for 1 hour. 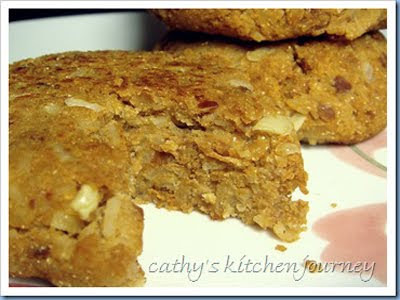 Remove from oven, glaze cake with syrup, and scatter almonds on top. Return to over to bake another hour or until center tests clean with a slim knife or skewer. Remove cake from oven onto rack to cool for 20 minutes. Remove from pan, peel off the side parchment, then carefully slide the cake off the pan bottom with the bottom parchment intact. Return to rack to cool completely. Once cool (it will take at least four hours), cake can be lifted to peel off bottom parchment. Cut with a serrated knife. Serves 16 (realistically, 8). Best served the same day, when it's very moist and tender. Leftovers must be wrapped tightly in plastic; it is discernibly dryer as it matures, like most fruitcakes, accounting for the tradition of soaking to cure in whiskey, stout, or rum. This recipe is for Simona of Briciole and Lisa of Champaign Taste, hostesses of the quarterly Novel Food event, featuring food and drink inspired by the books we love to read. Special thanks to both ladies for waiting on my post. Call it the last supper. When I walked out of my supermarket the other day, I was fortified with two serendipitous finds buried within my heavy grocery totes: a massive and corrugated bunch of cobalt-green dinosaur kale, and a dinosaur of another sort: the November, and final, issue of Gourmet Magazine. 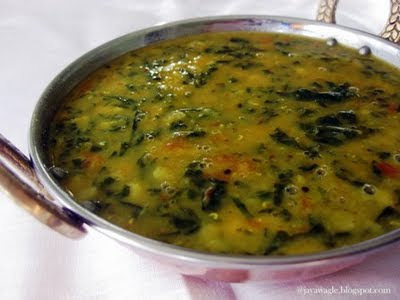 Once home, my feet up and fingers flipping through the glossy pages of the end of an era, I startled to discover a recipe for caldo verde, the thick and garlic-y Portuguese potato soup, distinctive for its mermaid's tangle of kale strips floating on the surface. Was it fate? There was a deep vat of potato chunks boiling and bobbing in a spicy broth at the back of my stove. I was already making caldo verde. Is my recipe an adaptation of Gourmet's version tucked away on page 68? Technically not. But why not say so anyway, as tribute to one of the trailblazers in bringing sophisticated world-class cooking and travel to home kitchens across the U.S.? And who knows? It might be back someday; look at Polaroid. Perhaps it won't be like a phoenix rising from the ashes; perhaps it will be a pheasant instead. 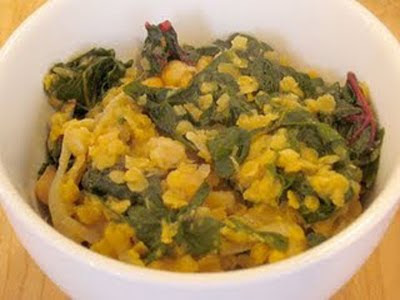 Chickpea Caldo Verde - My own vegetarian recipe, replicating the spiced flavors of chorizo without the pork. In a very large soup pot or Dutch oven, warm oil very briefly over low heat. Add garlic, pimentón, saffron, cumin, ancho pepper, and oregano. 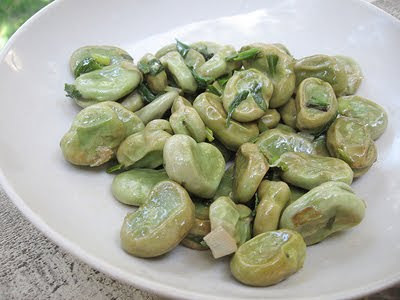 Sizzle mixture, maintaining low heat, until fragrant and garlic is golden but not burned. Add water, potatoes, salt, and pepper. Bring to a boil, then reduce heat to medium-low. Simmer until potatoes are tender (about 15-20 minutes, depending on variety). Remove from heat. Using an immersion blender or working in batches with a stand blender, purée broth until smooth. 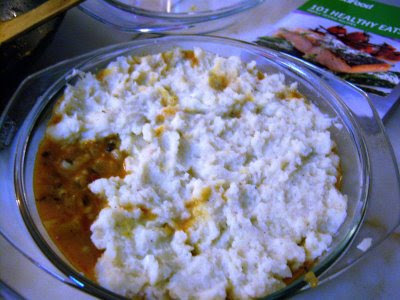 You can also mash a few of the potatoes to somewhat thicken it, yet keep it chunky. Return to low heat. Add kale and chickpeas, mixing to distribute. Simmer until they are heated through (around 3 minutes) and kale is slightly wilted. Taste for additional salt and pepper. Divide into bowls. 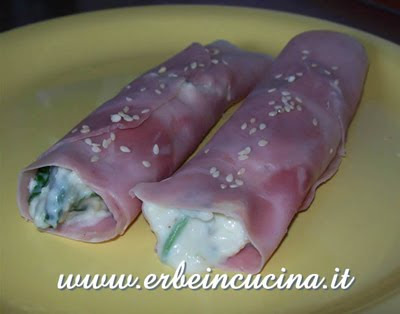 Drizzle each serving with olive oil and dot with hot pepper sauce, if desired. Serves 4-6, depending on size of bowls used. 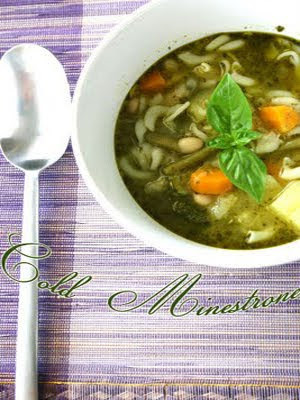 This recipe is for Jeanne of Cook Sister!, sparkling hostess of October's MLLA - 16. Jeanne's round-up will be online very soon. Do stop by for an eyeful of delicious dishes from around the world. 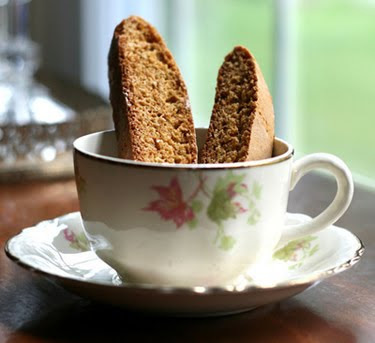 The good folks at Blogs.com have asked me to compile a list of Top 10 Beautiful Food Blogs. My guest post can be found here. Some are well known, others are recent discoveries, all are a feast for the eyes. If I was free to cite more than ten, my list would certainly be so very much longer. Brevity and Beauty - Pomiane's Eggs "Sur le Plat"
"First of all, let me tell you that this is a beautiful book. I can say that because this is its first page. I just sat down to write it, and I feel happy, the way I feel whenever I start a new project." Joie de vivre. That's what the French call it. And that's what the Polish call it, too, if you were Edouard Pomian Pozerski, which is what Edouard de Pomiane was originally called when he was born in Paris in 1875. A medical doctor by training, and a research scientist by occupation, Pomiane embraced cooking as both science and art. Before there was a Heston Blumenthal or a Ferran Adrià with their avant-garde and esoteric techniques, there was Pomiane, avant-garde for his time in his scientific determination to understand the esoterics of French traditional cuisine. In demystifying cooking into a enthusiastic pleasure to be enjoyed by all, he became a popular culinary expert and lecturer whose books are still in print today. Though many of his recipes would be considered quaint or out-of-date by today's furious trends and technology, the durability of his practical instruction infused with a writing style of a beloved, mentoring, charming uncle will keep him in print for generations to come. "First of all, there are three kinds of guests: 1. Those one is fond of. 2. Those with whom one is obliged to mix. 3. Those whom one detests. For these three very different occasions one would prepare, respectively, an excellent dinner, a banal meal, or nothing at all, since in the latter case one would buy something ready cooked." "First of all, don't expect too much. In this way you will not be disappointed at the end of the meal - a thing which is very harmful to the digestion. The day before the party, assess your host at his true value. Calculate, and I am afraid this is a little cynical, just what you are likely to get." Pomiane is as much a raconteur, perpetually bemused by human nature, ready with the anecdote, as he is a sensible tutor who neither lectures nor condescends. His French Cooking in Ten Minutes is a no nonsense approach to the standard repertoire of the good French home cook. Filled with over a hundred recipes, many no longer than a paragraph, this 1930 publication is a wealth of good will, good humor, good taste, and great reading. No wonder he was happy. 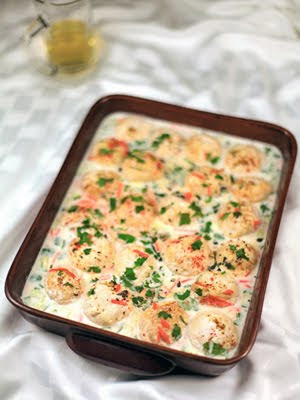 Eggs "Sur le Plat" - Adapted from French Cooking in Ten Minutes by Edouard de Pomiane. Scientist that he was, Pomiane nonetheless was fond of using measuring terms such as "a little" and "some." I have taken the liberty to add some numbers that work. The shallot, chives, and pepper are my additions. 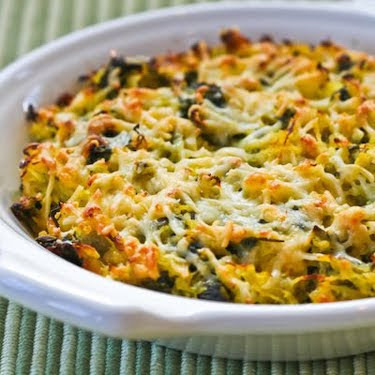 In an oven-proof gratin dish that has also been approved for stovetop use*, heat 2 teaspoons butter until melted over the lowest heat source. Carefully crack two eggs and tip them into the dish. (They will arrange themselves.) Maintain lowest heat. In meantime, in a small skillet, fry shallot briefly in 1 teaspoon butter. Remove from heat. Check on the eggs, continuing to cook until the whites are just set and opaque, repositioning the dish a few times for even heat distribution. (This is especially necessary if the dish is long.) Top with fried shallot and chives, then scatter with salt and pepper. Serve immediately, using pot holders to transfer dish to the table. Serves 1. *If cooking on an electric stove, you must use a heat diffuser as a buffer between the heating surface and the dish. Alternatively, a small metal skillet very generously coated in butter or oil can be used; you can either lift the eggs out with a wide turner or serve in the skillet. 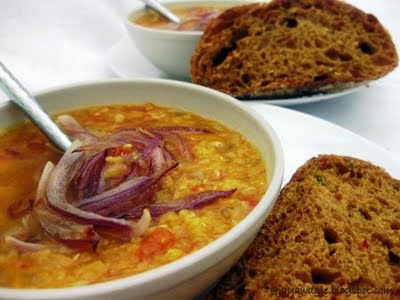 This post is for Sra of When My Soup Came Alive, hosting The Write Taste, an event featuring food writing. Though it wasn't a requirement, I did include a recipe. After all, it only took me ten minutes. 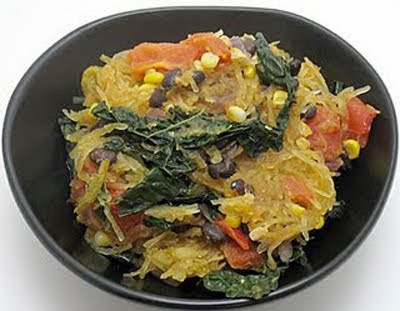 If Weekend Herb Blogging was running a popularity contest, then this week's blue ribbon would have to go to the hard-shelled, shaggy-centered spaghetti squash. 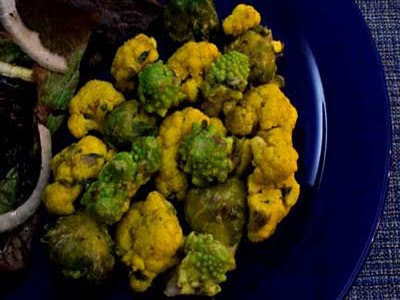 Three of the recipes collected here feature the unique yellow vegetable. It must have a really good PR firm. Fifteen other dishy recipes in the incredibly broad world of edible plant parts are represented here, as well. Every one of them is a winner. Do scroll down and admire the menu. Thanks very much for inviting readers into your kitchens for a peek and a taste. Please let me know if there are omissions or errors that I need to amend. a killer recipe with a bounty of exceptionally beautiful peppers. for a multi-layered, multi-flavored rice dish. filling addition to a light meal you can eat on the go. throw away for a salad as sweet as it is savory. to a sweet indulgence kissed with honey. 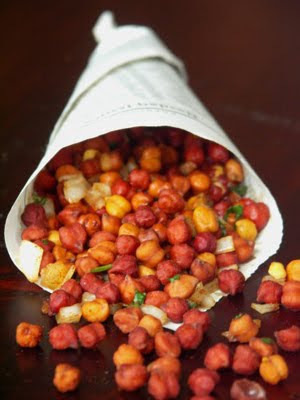 corn kernels are but a few simple ingredients away. when fortified with protein-rich pancakes punched up with spices. collection of brassicas known for their strength and vigor. 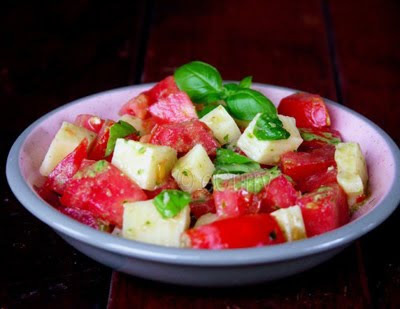 the picking for a classic salad that epitomizes Italian flavors. 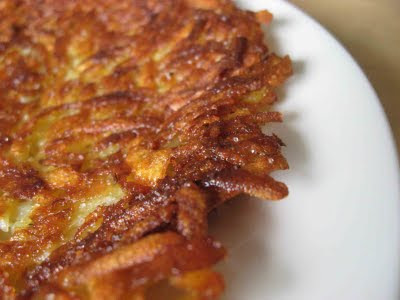 perfection in the famous Swiss version of hash browns. served a hearty helping of a meal made with a pasta impostor. 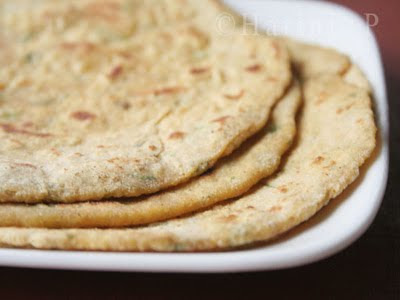 fragrant circles of Indian bread that are tall on flavor. 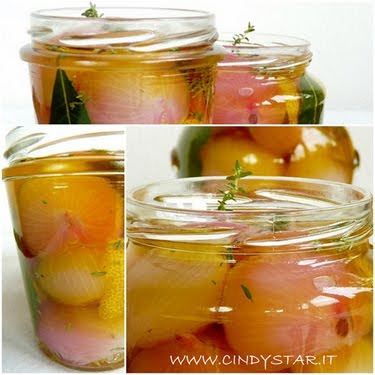 of home-preserved shallots glistening in olive oil and herbs. the simplest of squash dishes that's always in tune. 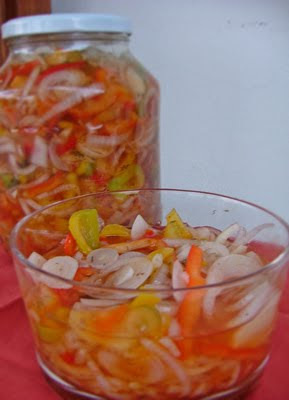 you practice kitchen therapy with the art of pickling. 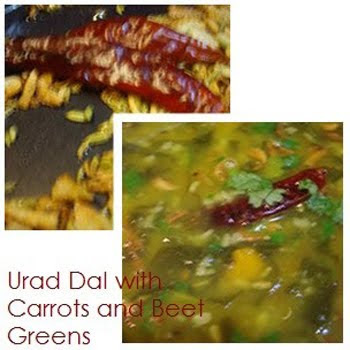 with a lively vegetable mix of green, red, and gold. 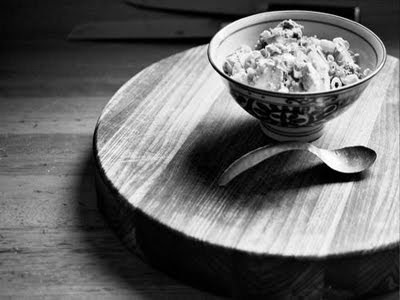 custard in an old-fashioned dish of English origins. an old-time nursery favorite that fools and frustrates. Thanks to Haalo of Cook Almost Anything at Least Once for allowing me the opportunity to host this long-running event for the umpteenth time. 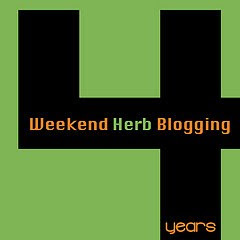 Weekend Herb Blogging #205 is currently being hosted by Cinzia of Cindystar Blog. Never trust anything that sounds like it was named by or after a village idiot. My Sunday started easy enough. I was up before dawn, sipping coffee, proud of myself for just starting to catch up on blogging duties. My day was all planned out before me: as soon as the sun reared above the roof, I would trot out my basket of plump and impeccable plum tomatoes. I would carefully select the finest, blemish-free specimens to arrange before the window to photograph. I would take a few dozen shots, upload them on the PC and, again, carefully select a few as finalists for this blog post. Then I would, again, trot the whole lot into the kitchen for a quick few steps before simmering them down into a sauce to be finished generously with Cheddar cheese melting into a swirl of deep orange purée, the foundation of the messy, New England nursery comfort classic, Rinktum Tiddy. No one exactly knows who invented Rinktum Tiddy; it's one of those folkloric, traditional recipes passed down by Americans whose ancestry hailed from England, very similar to Welsh Rarebit. It seemed an ideal and easy little meal that could be slightly jazzed up for a more stylish presentation than slopped over some toast points. Why not fill ramekins with the soupy-sauce, then top them with croutons and a shower of extra cheese before sliding them under the broiler, à la French onion soup? All was well until I reviewed my photos. I wasn't happy with any of them. Not one. So I grabbed back the tomato models from the kitchen, set them aside, and made the sauce with the remainder. I figured that while it was bubbling on the stove, I would shoot another batch of photos. All was returned to well...until I returned to the kitchen. The tomatoes were ready to be puréed, and I had streamlined the recipe further than its already rudimentary ingredients by omitting the egg to avoid the tedious, but essential, precision of not curdling it. Nothing could go wrong, except, of course, the curdling of the Cheddar. Yes, folks, Cheddar is one of those dairy delights that's great when cold and carved off the slab, but fiendishly fickle at a temperature above tepid. I set aside the pot of cheese-streaked sauce and set about to do it again (with canned tomatoes), this time hovering over it, testing the sauce for just enough heat to melt the cheese without it seizing up. And it curdled again. Now who's the village idiot? Rinktum Tiddy - Loosely based on this recipe, but I wouldn't recommend it without the changes I made to save it. See my note below for an alternate, nearly foolproof method. Despite the kitchen chaos, it was actually quite tasty. 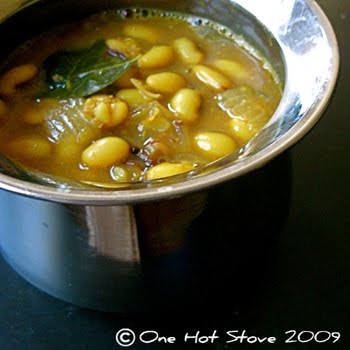 In a large, heavy, non-reactive saucepan, warm butter or oil over medium-low heat. Add onions, sautéeing until golden and translucent. Add tomatoes, mustard, salt, and pepper. 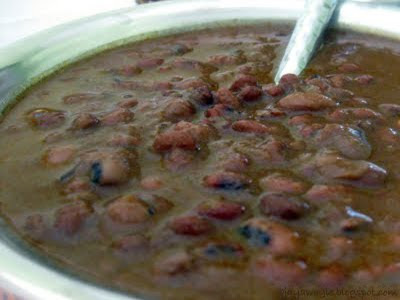 Bring to a boil, then simmer for 15 minutes. Remove from heat and cool to luke warm. Pour into a blender to purée. Return to saucepan. Stir in a handful of cheese (from the 8-ounce measure) and return saucepan to heat, keeping it adjusted to its very lowest setting. Stir constantly and repeat until all the cheese is melted. Remove immediately from heat and pour sauce into a large non-reactive bowl. 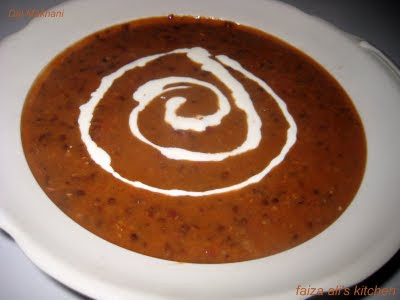 If it shows any unpleasant signs of curdling*, rub the sauce through a strainer into another bowl below it. Divide sauce into 4 broiler-proof ramekins. Toss remaining 4 ounces of cheese with croutons. Arrange ramekins on cookie sheet. Mound mixture on top of each ramekin, then slide cookie sheet under broiler, watching carefully, until cheese melts and croutons brown. 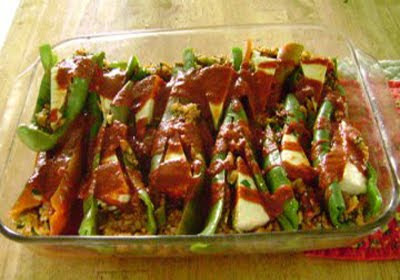 Remove from oven (will be very hot), and serve immediately. 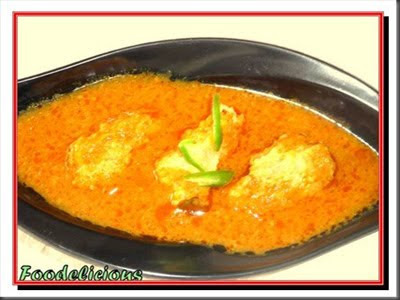 *You can also make a separate classic cheese sauce with a roux base which can be added to the tomato-onion purée (without the seasonings and mustard), then proceed with the topping. If all else fails, there's always take out. This post, featuring tomatoes, is for Weekend Herb Blogging #204, hosted by me, presided over by Haalo, and originated by Kalyn. I'll be posting the round-up tomorrow night, New York time, unless something else curdles. 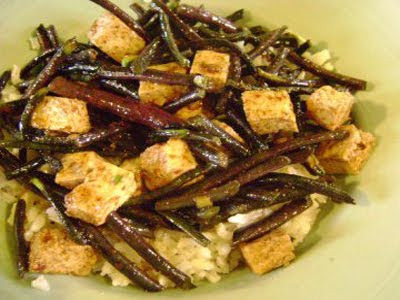 Are you kicking around ideas for a dish that predominantly uses ANY ingredient derived from a plant? If so, then kick one over here to Weekend Herb Blogging, the enduring weekly event, now in its fourth year, and hosted once again by yours truly. The rules are simple, and there's plenty of time for you to create something fabulously delicious to share with the food world. Thanks to those who have already sent in their recipes; I'll be acknowledging them formally and individually in the next day or two. Right now (literally, before dawn), I am preparing a recipe using up the last of the northern summer's red-hot local tomatoes. I look forward, as always, to seeing your great creations as part of the round-up, scheduled to be online on Monday, October 12, New York time. See you soon! Recipe for these fantastic fritters after the meme. I am here. Barely. It's been rather rough-and-tumble for me lately. I wish I could report differently, but it ain't going to get better any time soon, so apologies in advance for pretty much playing phantom a while longer. (Yes, I am hosting WHB #204 October 5 - 11.) In meantime, I'm answering a meme that Swati of Swati's Sugar Craft passed on to me so long ago, it must have been in a former life. I now sent it to Rose, Martha, Ricki, Simona, Nanditha, and Jessica, to play with or leave alone - no obligations whatsoever. As you can see, it's taken me over a year to respond to this one. Take. Your. Time. I can't even remember. Really. I think it was Ratatouille. ??? I'm not kidding. On those very rare occasions when Scott and I actually go out to a flick, it's always animated kids' stuff: Corpse Bride, The Incredibles, Wallace and Grommit, Flushed Away...On the homefront, however, well, that's a different story. It's all very art house, subtitled, and sophisticated. So, every now and then, after a belly full of that, we have to run out to clear our heads with cartoons. Several. I am currently juggling Le Carré's Karla Trilogy; Banville's Athena (for the third time); and I just added Camilleri's The Shape of Water. I've tried reading sequentially, but it just doesn't work for me; old multi-tasking habits die hard. Saveur, The Atlantic, Time Out New York. Lavender, peony, violet, scented-geranium leaves, cardamom, peach, cilantro. The approach of a train; the syncopated tattoo of rain thumping the roof; the shriek of raptors; and the holy, surreal silence of walking in a powdery snowfall. I rarely eat fast food, but Burger King has killer coffee and fries. 11) FINISH THIS STATEMENT— "IF I HAD A LOT OF MONEY I’D..."
Buy a boat and learn to sail. No, I drive the speed limit (I'm not into an early grave nor a whopping traffic summons), and I'm not crazy about the guy in back of me kissing my tailpipe, either. You can't sleep with stuffed animals when you have the real deal; the bed is crowded enough. Cool, always cool. The scarier, the cooler. 17) FINISH THIS STATEMENT-"IF I HAD THE TIME I WOULD…"
Learn to sail, even if I can't afford that boat. Yes, as a matter of fact, I do. And I've a recipe coming up that makes wonderful use of them. Since it's already been nearly every other color, anyway, it's time to go back to being a brunette. I miss it. Truly. 20) FAVORITE SPORT/S TO WATCH? 21) ONE NICE THING ABOUT THE PERSON WHO SENT THIS TO YOU? Swati's an all-around good soul. She hasn't blogged in quite some time - shame; she's got a natural talent for fondant cake decorating. 22) WHAT'S UNDER YOUR BED? 23) WOULD U LIKE TO BE BORN AS YOURSELF AGAIN?? The short answer is yes. The long answer is complicated, philosophical, and would bore you stupid with too much information. These twenty-eight nuggets of nothing are more than enough about me for the moment. 24) MORNING PERSON OR NIGHT OWL? Night owl, although my favorite times are those of twilight, the dawn and dusk. 25) OVER EASY OR SUNNY SIDE UP? 26) FAVORITE PLACE TO RELAX? In bed, juggling all those books. 28) FAVORITE ICE CREAM FLAVOR/S? Butter Pecan, Black Raspberry, Coffee. 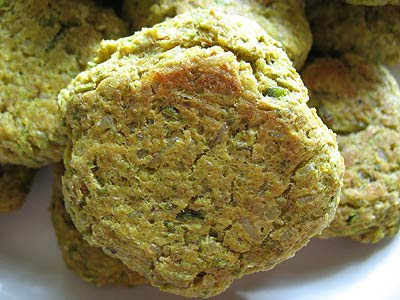 Make the fritters: Place the cauliflower, broccoli, beans and onion in a food processor. Process until they're finely chopped and starting to clump together. 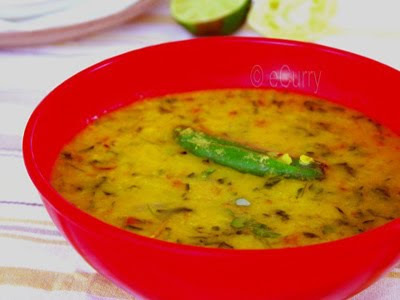 Transfer this to a bowl and then add in the rest of the ingredients, except the oil. Mix together until it is combined - you may need to mash the mixture slightly with the back of a spoon to get the right texture. Season with salt and pepper. 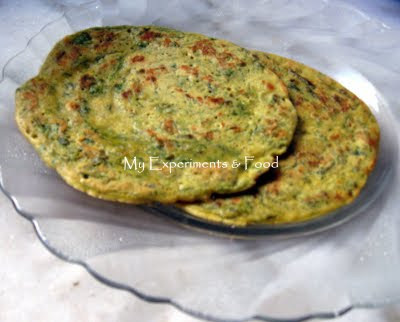 Form the mixture into 12 fritters - you may find it easier to mould the mixture with wet hands. Cook the fritters: Place a non-stick frying pan over a medium heat. Add a drizzle of canola oil and once this is hot gently place fritters in the pan. 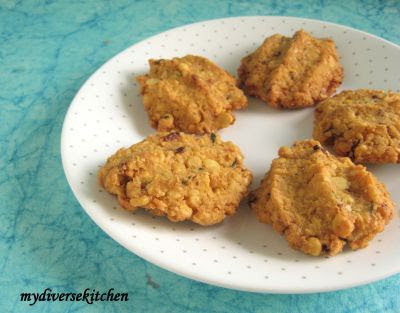 You'll need to cook the fritters in batches of about 4 – 5 depending on the size of your frying pan. Cook for 3 – 4 minutes on each side, until browned and cooked through. Transfer to kitchen paper to drain and then serve. 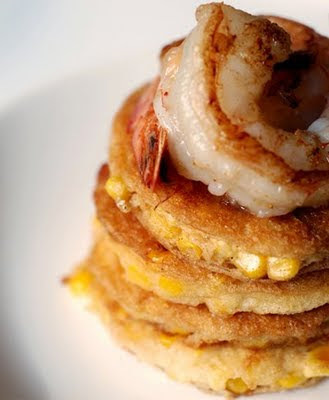 These fritters can be served in lots of different ways. 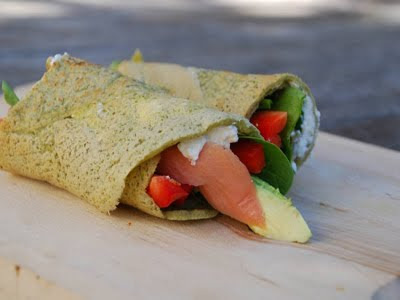 I like them with brown rice and a dollop of natural yoghurt, but they also work well in a wrap with salad and mango chutney. You could top them with a soft-poached egg, or have them as a side to grilled fish or meat – again with a spoon of natural yoghurt. 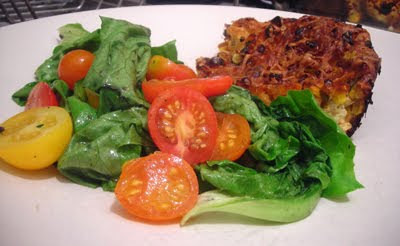 Leftover fritters can be kept for 2 – 3 days in the fridge. 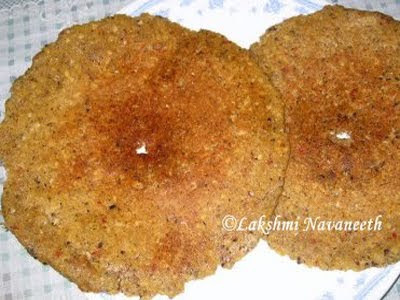 They don't freeze when cooked; however, you can freeze the uncooked mixture, formed into fritters. Well, if these don’t get you eating (and loving) cauliflower and broccoli, nothing will. Delicious with the mango chutney, yoghurt and salad combo. And my auxiliary notes: These fritters, as terrific as they are (I've made them thrice), are very moist, delicate, and crumbly. I chilled the mixture first, then froze the formed patties just to solid before grilling them very, very slowly until well browned, set, and dry before turning them quickly, yet carefully, with a long, slotted turner. You won't loose a crumb, and you won't want to, regardless of dressing them up with sauce (I mixed 1 part mango chutney with 4 parts Greek strained yoghurt) or dressing them down with a scattering of sea salt. Jeanne of Cooksister! is hosting MLLA 16, the October round. She will be announcing in the next few days. They're all here: snappy salads; savory soups and stews; cauldrons of curry; fragrant folds of flatbreads; bouncing baby dumplings; stir fries and fritters; pilafs, patties and pop-in-your-mouth snacks; plus a little sweet something to finish off your meal. If I've left anyone out, or there's a correction that needs tending, please let me know, and I will update right away. A thousand apologies that I have not been able to include my traditional one-liners, puns, and other frilly (silly) intros this month. It's one of the reasons I enjoy hosting events so very much, but recent and relentless demands on my time, energy and focus have been much greater than I have anticipated. I could have managed it eventually, but it would have required at least an additional week, and you have already waited much too long. 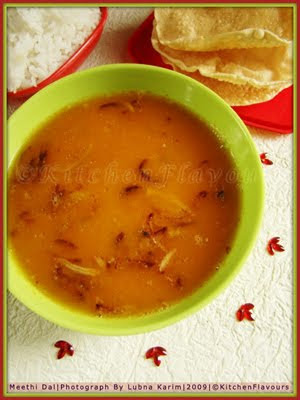 Besides, congrats are long overdue for Preeti of Relishing Recipes, the winner of the random drawing. Thank you all very much for your consistently amazing recipes. I feel blessed to be the recipient of your hospitality and creativity month after month. The pleasure is all mine. Preeti is the winner of MLLA 14! Los Angeles (San Pedro), California, U.S.A.
Sia of Moonsoon Spice is hosting MLLA 15, the current edition of this long-running event. She'll be accepting your great dishes through September 30. I'm offering an additional prize this month. Hope your participation proves lucky! Thanks always!